ASBESTOS LUNG CANCER: What are the types of asbestos fibers? Chrysotile (white asbestos), also called "Serpentine" fibers, are long and curled. The amphiboles, long straight fibers (including actinolite, amosite, anthrophyllite, crocidolite, and tremolite) are much more likely to cause cancer of the lining of the lung (mesothelioma) and scarring of the lining of the lung (pleural fibrosis). Either group of fibers can cause disease of the lung, such as asbestosis. The risk of developing asbestos-related lung cancer varies between fiber types. 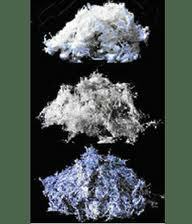 Studies of groups of patients exposed chrysotile fibers show only a moderate increase in risk. On the other hand, exposure to amphibole fibers or to both types of fibers increases the risk of asbestos lung cancer by two fold. Although the Occupational Safety and Health Administration (OSHA) has a standard for workplace exposure to asbestos (0.2 fibers/milliliter of air), there is debate over what constitutes a safe level of exposure. While some believe asbestos-related disease is a "threshold phenomenon," which requires a certain level of exposure for disease to occur, others believe there is no safe level of asbestos.